Heart Handmade - Crafts, craft ideas and arts and crafts blog: She's done it again! It's no secret that most bloggers don't like to feature the same artists over and over again (no matter how much we love them), but there are a few that fall into the exception category. For me, Abigail Brown is pretty high up on that list. 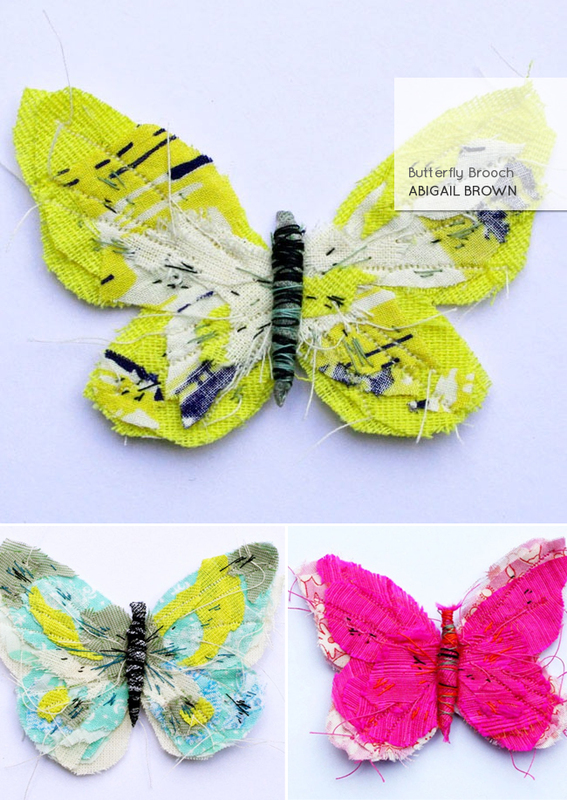 Ms. Abigail, love your new butterfly brooches. You amaze me every time you come out with something new. oh my gosh - so beautiful!! oh those are gorgeous! love the stitching and layers of fabric. Oh those are soo pretty. Woa. I love the idea. hol-eee sheet./ i must to have one NOW. What a wonderful start to my day! Thank you so very much for your compliments Marichelle, and for featuring the brooches on your wonderful blog. I rather liked them myself but you can't ever know what other's will think. I'm delighted to hear you all like them too...thank you for your comments. So gorgeus! Love them, so simple and soooo beautiful! but you are right! they are too retty not to be shown! so so unique! I really like the textures! These are like small pieces of textile art! I'm off to check out some more of her work. Wonderfully bright and pretty, just had a look at her site - beautiful work. OMG!!! I am totally amazed. That is really very beautiful. love it!!! OMG!!! I really love butterflies and this really attracts my attention. These are so lovely. Love it!!! WOW!! these are really great. i love butterflies!! I love these - gorgeous without being too 'little girl fairy'. Can be tough to get right with butterflies, but these hit the spot. These butterflies are amazing! You can see all of the detail and work that went into them.. stunning! Oh Wow! Those are fabulous and precious! I love the butterflies. I am really inspired to create one today. OMG!!! These are so beautiful. I really like looking at these colorful butterfly brooches. Great post!! !